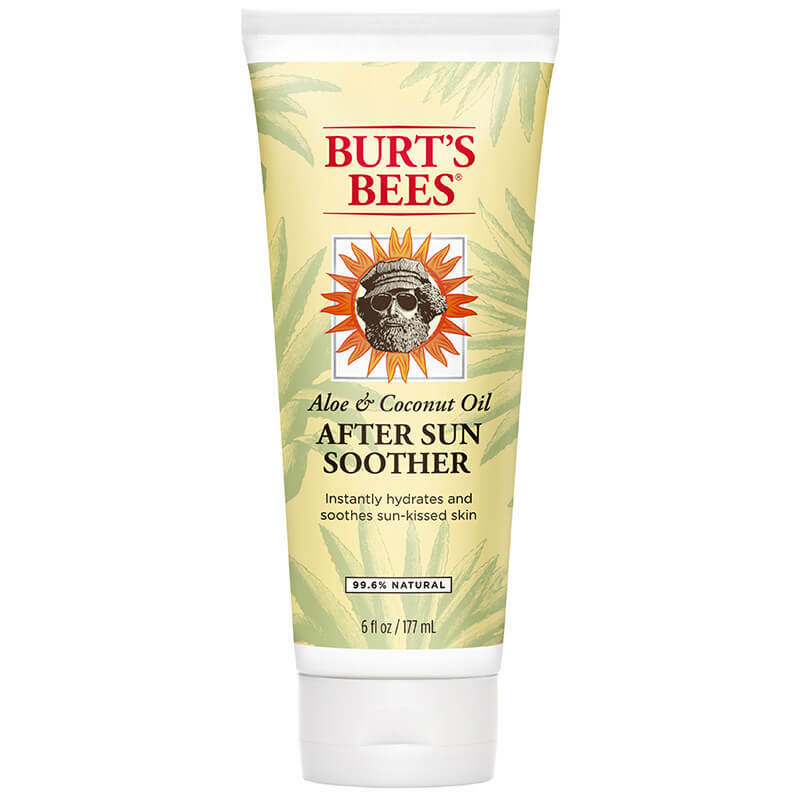 Burt's Bees | Aloe & Coconut Oil After Sun Soother- 6 fl. oz. Aloe & Coconut Oil After Sun Soother- 6 fl. oz. is rated 5.0 out of 5 by 30. Replenish moisture to sun-kissed skin with this intensely hydrating lotion. Packed with Aloe Vera and hydrating elements from nature, it's the quick-absorbing formula your skin needs to feel revived, soft and healthy after a day of fun in the sun. Indigenous to Europe, Asia and North America, Linden Trees yield a flower frequently used in medical preparations to help skin rejuvenate. Filled with helpful and powerful antioxidants, Linden Extract can really feel like a lifesaver. 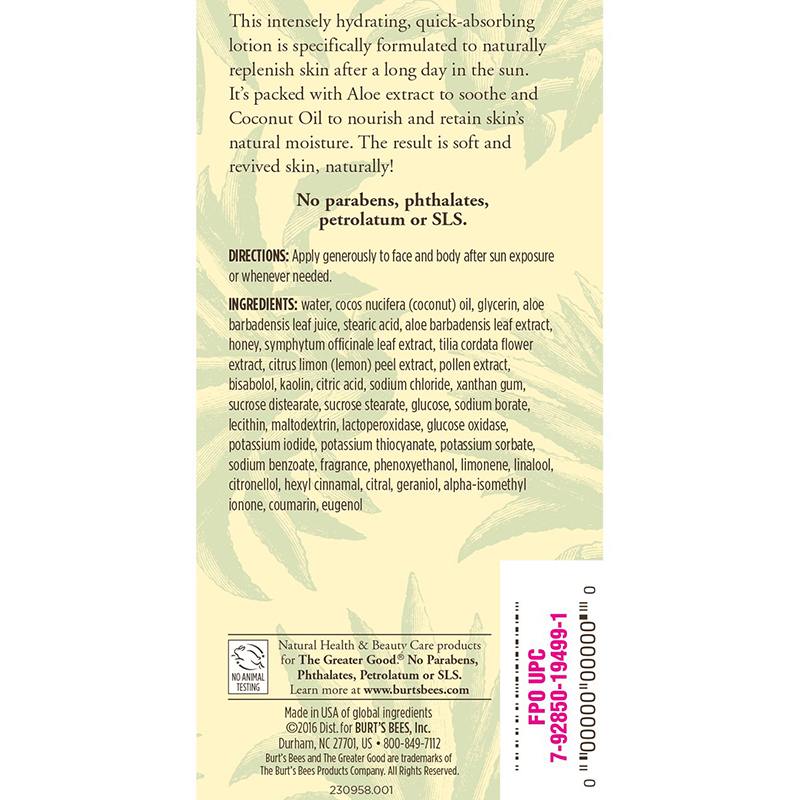 Ingredients: Water, cocos nucifera (coconut) oil, glycerin, aloe barbadensis leaf juice, stearic acid, aloe barbadensis leaf extract, honey, symphytum o_cinale leaf extract, tilia cordata flower extract, citrus limon (lemon) peel extract, pollen extract, bisabolol, kaolin, citric acid, sodium chloride, xanthan gum, sucrose distearate, sucrose stearate, glucose, sodium borate, lecithin, maltodextrin, lactoperoxidase, glucose oxidase, potassium iodide, potassium thiocyanate, potassium sorbate, sodium benzoate, fragrance, phenoxyethanol, limonene, linalool, citronellol, hexyl cinnamal, citral, geraniol, alpha-isomethyl ionone, coumarin, eugenol. Will this lotion help a face heal from 2nd degree burns? No! If you have 2nd degree burns, you will have blisters. Once those blisters pop, you will have raw, oozing skin. You should avoid putting any products on that skin, and see a doctor, as it will have a very high chance of getting infected- he may prescribe something like Silvadene to put on it.